More seniors are getting a C or better in their A-G classes. 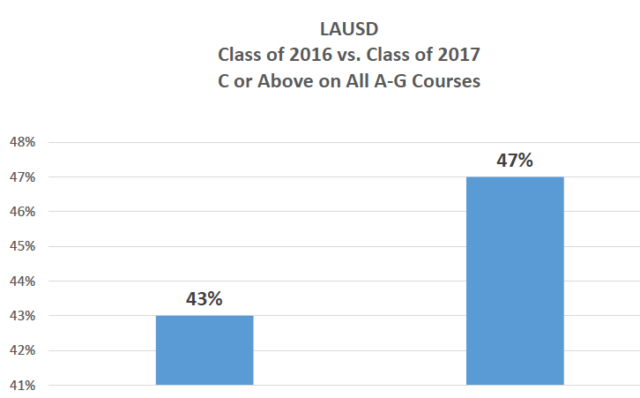 Students in the Class of 2017 are on a better track toward graduation than seniors were at this time last year, according to preliminary reports released Tuesday by LA Unified. About 47 percent of the upcoming graduation class has a C or better in their required A-G course requirements. That’s compared to 43 percent at this time last year, according to Superintendent Michelle King’s report at the first school board meeting of 2017. The graduating class this year so far has 59 percent of the students on track to graduate, with about 19 percent one or two classes behind. About 22 percent of the students are more than three classes behind. 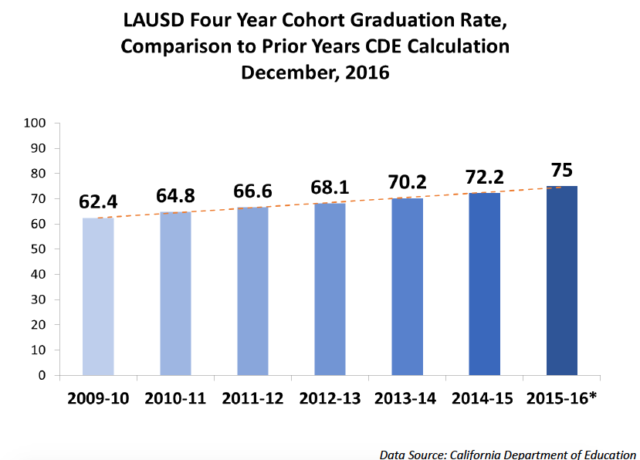 At this time last year, 54 percent were on track to graduate while 20 percent were one or two classes behind, and 26 percent were three or more classes off track to graduate, according to Cynthia Lim, LA Unified’s executive director of Office of Data and Accountability. 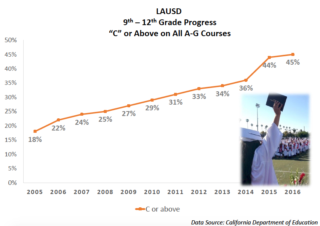 Overall, the graduation rate of the 2015-16 graduating class was 75 percent, which was a record for LA Unified, showing a progressive increase from 62 percent for the 2009-10 graduates. The district has yet to specify how many graduates took online credit recovery classes. High school students with a C or above in A-G courses. “We are ahead by 5 percent where we were this time last year, and we will be getting the students back on track,” said Carol Alexander, director of the district’s A-G Intervention and Support. Part of the credit for better tracking student improvement is what King describes as a “revolutionary tool where schools and students can click and track their graduation requirements very easily.” She said she uses the Graduation Progress Dashboard to review schools and specific student progress, which tells any teacher, parent or administrator where the student stands and what requirements still need to be fulfilled. It is an individual graduation plan for each middle school and high school student to chart the way to graduation and is available to teachers, parents and administrators. Overall, 91 percent of the middle school and high school students are on the plan and are in the system since it launched at the beginning of the school year. “This will accelerate the movement to graduation and we will be better able to intervene if there needs to be additional support,” said King, who hopes to achieve a higher graduation rate this year. School board President Steve Zimmer congratulated King on a good first year and said it showed remarkable improvements in the district since 2009. “These are real dreams coming true, and it represents a fundamental shift from deficit mindset to an assets-based mindset,” Zimmer said. “It is a celebration of 75 percent graduation but a call to action for the 25 percent remaining,” Zimmer said.